In what is considered a “historic moment,” a United Methodist delegation is in China this week to renew old friendships and forge deeper relationships with Chinese Christians. The trip is a joint effort of the United Methodist Council of Bishops and the Board of Global Ministries. The delegation’s co-leaders are San Francisco Area Bishop Warner Brown, the council’s president-designate, and North Carolina Bishop Hope Morgan Ward, the mission board’s president. The visit began April 20 in Shanghai, where the delegation split to attend Sunday worship at two churches originally started by the Methodist Episcopal Church South — Mu’en Church and Jingliin Church. Both services were packed with worshippers. In his greetings at Mu’en Church, Brown told the congregation that love for “the people who love Jesus in China” had long been a part of the Methodist heritage. “Even when we were unable to be in communications, we still cared,” he said. Among those welcoming delegation members at Mu’en was the Rev. Shi Quigui, a former pastor who had served the church there in its previous identity as Moore Memorial Methodist Church, both before and after the Cultural Revolution of 1966-76. That eventual name change reflects the fact that churches in China entered a post-denominational era when the Protestant Three-Self Patriotic Committee was formed in 1954 to signal a new identity under the new government of the People’s Republic of China. At Jinglin Church, Ward said she was impressed by the energy and vitality evident during worship. “It was a strong connection with the heritage of Methodist mission in this historic place as well as a yearning for faithfulness as the church moves into the future,” she said. A meeting the next day with officials and staff of the China Christian Council included an acknowledgement of that heritage and the continuing relationship between United Methodists and Chinese Christians. Brown agreed with the need for a strong relationship. “Friendship with the churches in China has been longstanding and deeply cherished,” he told the council. Wisconsin Area Bishop Hee-Soo Jung, who serves as chair of the United Methodist Committee on Relief, pointed to the significance of a joint visit to China for the first time by bishops and mission agency representatives. “I think this is a wonderful, historic moment,” said Jung, who has made nine previous trips to China on his own or with other groups. 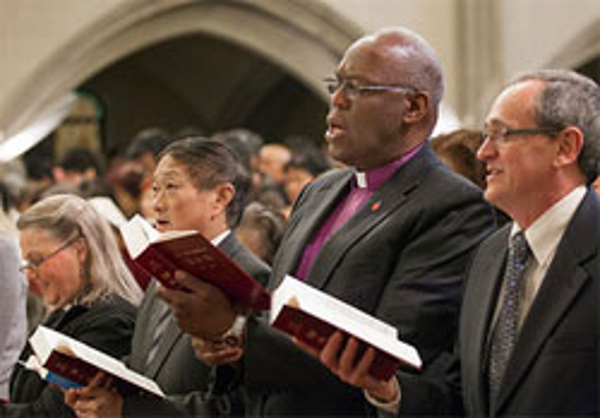 Bishop Mary Ann Swenson, the council’s ecumenical officer, invited China Christian Council leadership to send representatives to Ecumenical Day during the 2016 United Methodist General Conference, the denomination’s top legislative body, in Portland, Ore.
“We want to relate to the China Christian Council as our key partner in China,” added Thomas Kemper, top executive of the Board of Global Ministries. Among the challenges are better development of China’s 21 seminaries and Bible colleges and a remedy to the “severe shortage” of qualified pastors. New England Area Bishop Sudarshana Devadhar, chairperson of the ecumenical relations commitee for the Council of Bishops, said he appreciated the “radical hospitality” offered by the Chinese Christians and what could be learned from them. “This is a new possibility of doing mission and ministry together from a global perspective,” he said. Other delegation members include George Howard, staff leader for mission and evangelism, and Rebecca Asedillo, Asia-Pacific executive secretary, both with the Board of Global Ministries. After being hosted by the council at a nearby restaurant for a traditional Chinese lunch banquet, the delegation traveled to Nanjing by bullet train for several days of meetings and project site visits with the Amity Foundation, Jingling Theological Seminary and Mo Choulu Church. On Friday, the delegation will meet with groups in Beijing, including the Beijing Christian Council, China Islamic Council, Chinese Academy of Social Sciences and State Administration for Religious Affairs. What is Your Aldersgate Experience?